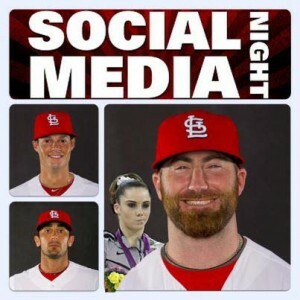 As you can see from the look on McKayla Maroney’s face, McKayla is not impressed with Social Media Night at Busch Stadium. Perhaps she was not alone, either. An extremely unscientific and informal poll of random people who attended Social Media Night on Wednesday left me with the impression that people were generally unimpressed with the whole event. Among first timers, the most common complaint was that none of the players signed autographs. Honestly, the advertising for “#CardsSocial” mentioned nothing about players signing autographs, so maybe expectations were misaligned just slightly. On the other hand, you might expect an event labeled “Social Media Night” to be a social thing involving social media interaction. You might also expect it to take place at night, but that really misses the point. The Q&A portion of SMN consisted of pre-printed questions taken from tweets sent many hours before the event. The delay between the questions being asked and the real-time responses would have made NBC proud. Certainly logistics make it difficult to increase the level of interactive Q&A, but a screen dedicated to scrolling tweets that the players could use to pick and choose questions to answer might not be asking too much. We have the technology. Naturally, I saw a lot of familiar faces from previous social media events at Busch, and I was curious to find out what social media veterans thought of #CardsSocial. Turns out that their collective set of complaints was a tad bit on the large side of big. Daniel Descalso, David Freese, and Jon Jay participated last year and signed autographs for several people (especially kids) prior to answering questions. What changed? 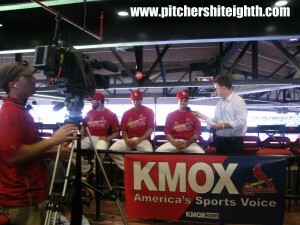 Everyone who attended last year received a “Tweet Me In St Louis” tshirt. This year there were 3 such tshirts given away as raffle prizes. Many people were unable to use the $5 in Cards Cash that was supposed to be available on the ticket for #CardsSocial. Personally, I went through the wonderful experience of watching someone input ticket codes on a handheld device, because the scanner could not validate the ticket. Nice touch. The raffle prizes were quite lacking in both quantity and quality when compared to SMN 2011. Many fans in attendance were simply there for the good ticket deal and knew nothing of social media. 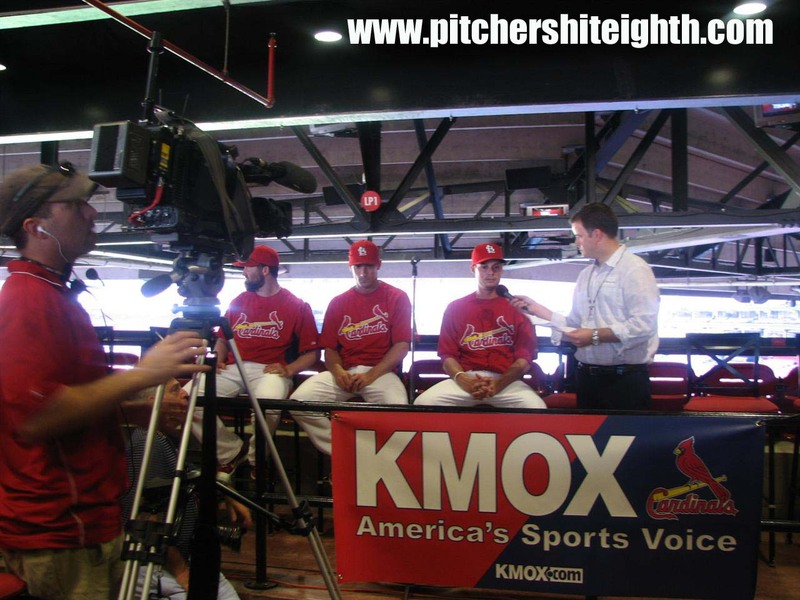 Granted, I agree that #CardsSocial failed to match the original #CardsSMN in terms of overall impression, but the trio of Jason Motte, Matt Carpenter, and Joe Kelly was like a Three Stooge’s rerun. The players provided candid answers without relying too heavily on baseball cliches, and they genuinely appeared happy to interact. The fact that Motte and Kelly both spent time tweeting while seated for the Q&A probably endeared them to even more fans. 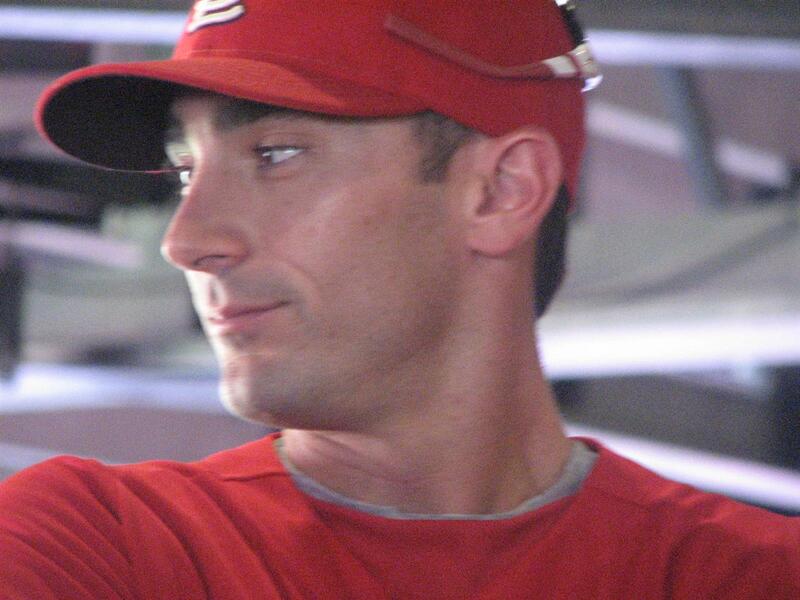 If you happened to miss the event, you should probably know that Matt Carpenter has a very witty, dry sense of humor that I believe most people can appreciate. Maybe his obsession with “1 sugar free vanilla pudding cup” seems a bit much, but it works for him. The selection of Turnpike Troubadours for his walkup music? Not so much. Still, he defended his selection, and he even made it known that even his teammates have questioned his taste in music. Solid stuff. Maybe the sense of humor and musical choices explain the backwards sunglasses…..or not. Then again, I usually believe that all’s well that ends well, and Wednesday ended with a 5-2 win over the Diamondbacks. Perhaps the icing on the cake was Motte putting down his iPhone long enough to notch his 27th save in the process. Follow gr33nazn for more about #CardsSocial! 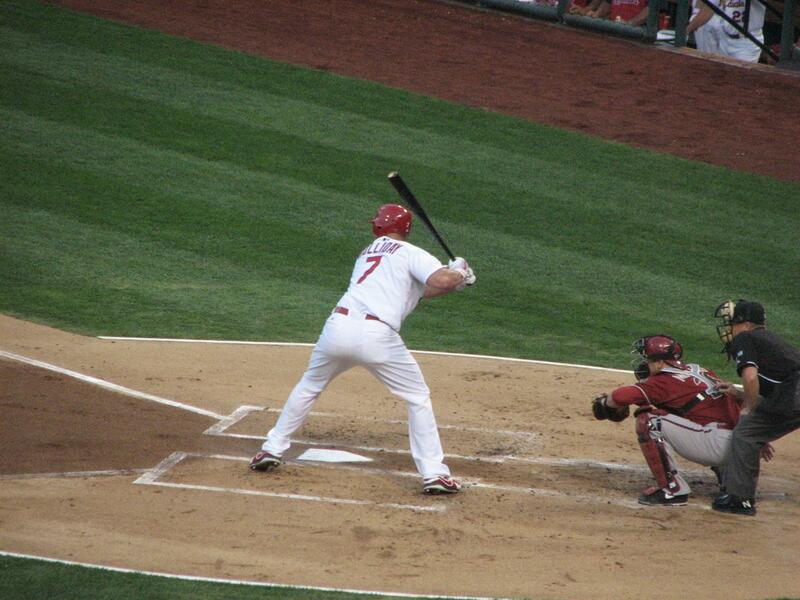 TIDBIT: Here is a gratuitous Matt Holliday shot just for @Erika4stlcards…. MORE TID: Fridays on Twitter means a lot people using the “#FF” hashtag to suggest people that they think others should follow. More often than not, several people will graciously include me, and I’m humbled by the gesture. Rather than just return the favor or say “thanks”, I’m listing everyone on this page, and I highly recommend them as either members of Cardinal Nation or just plain good people with interesting thoughts and views.